Where do you live? In Maryland. How long have you lived there? Nearly all of my life. Are you married? Yep. I have a wonderful wife. Education? Bachelor’s degree in computer science. Who is your favorite author and book? Tolkien. Lord of the Rings trilogy. What is your preferred genre? I currently write Fantasy, but actually prefer to read Science Fiction. When my children were little, I told them bedtime stories every night. One day I started a story that stretched out for about a year. My wife said, “You should write that down one day.” So, I started, and it’s turned into four novels so far. 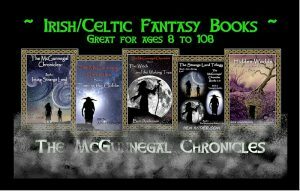 Four books in The McGunnegal Chronicles, an allegorical Irish fantasy series for middle-grade to young adult. I’m currently working on book #5 in The McGunnegal Chronicles series. Its tentative title is The Knocker’s Secret. This book is a continuation of book #4, and in it I plan to have tons of fantastic adventure and fun with dwarves, trolls, giants, and other creatures of legend, but also gently explore some deep and thought-provoking subjects, such as the classical view of time, personhood, suffering, obsession and madness, and a few other light topics. Yep, all wrapped in an allegory appropriate for a younger reading audience. Should be a ton of fun! My readers. They keep encouraging me to write more. Plus, I just really need to finish this trilogy of trilogies! So far, the goblin named Nous has been my favorite, although the dwarf, Fafnir, is catching up. I really had fun exploring Nous’ character in the first three books. Nous’ journey from being an ugly, despicable goblin to being… well, I won’t give it away… was a thoughtful adventure of redemption, change, and in the end, personal sacrifice. Is there anything of you in that character? I hope so! There aren’t too many allegorical Irish fantasy book series out there for a general audience (ages 8 to 108!). As the book series is expanding, I’m also treading into a wider Celtic and Nordic mythology/legendary exploration. Adol laid Nous down on the shore, readied his hammer, and turned to face their enemies, but Colleen and Frederick knelt down beside the goblin. Nous’ burned eyelids fluttered open, and his gaze found hers. “Nous… wishes…” he began, but his breathing became ragged and he could not speak further. With great effort, he raised a hand and reached out to touch her face. Then his eyes closed, and he grew still. She shut her eyes, ignoring the rising clamor around them, and she willed herself to find him – to find the life force of his spirit within the Great Song, to listen for the pulse of his being. And there he was. She watched as his heart beat one last note in perfect harmony with the Music, and then the song of his life began to lift away. With all the power that was in her, she pursued him, trying to catch the fleeting notes that he played, willing them to stay. They paused for a moment, echoing in the chamber, then with a sound that seemed to smile, they flew upward into unfathomable heights and vanished away. Colleen sat on her knees and sobbed. Frederick put his arm around her, and tears fell down his own face. But their sorrow was interrupted by Adol’s voice. I’d say trying to keep an allegorical consistency amid many adventures and characters was a challenge. I hope I did justice to the idea. What was your favorite book to write? Probably book #3 so far, since it wraps up the first trilogy. Although book #4 (as the beginning of a second trilogy) comes close. I guess it’s just a part of who I am. I need to do it. There are stories inside me that need to find their way to the page. Sometimes they just come. Sometimes I’m inspired by the world around me. Hiking in the mountains, sitting under starry skies, listening to the sound of deep forest – things like that – are inspiring to me. But reading and listening to audio books by spiritual writers is also inspiring. I do my best to take all of those experiences and whisper them in my tales. Book #5 is on the way. Plus I’ve contracted with my narrator to do the audio book for book #4. That should be done around the end of October 2018. I’m also poking around to see what the possibilities are for a short film or another book trailer. It should all be great fun!